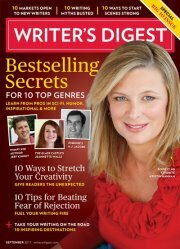 See Linda Formichelli’s Conference Scene column in the September issue of Writer’s Digest to read our suggestion on how to get the most out of a conference. In the article titled Make No Mistake (pp 60-61), we give tip #2 out of 10 she solicited from conference organizers around the country. Thanks to all the WriteAngles committee members who contributed ideas for the story.